The secret to muri is in its simplicity. Puffed rice and crisped rice (like Rice Krispies) are both made with rice but each have distinctive tastes and textures. The making of crisped rice cereal involves sugar in the popping process. Muri is made by dry roasting white or brown rice kernels alone, hence the difference. This difference is not as subtle as you may think at first glance. Ask any Bengali and you’ll likely get a comparative essay. There’s no wonder it is Bengal’s number one snack item. Muri is its own culture. Muri is also in my bloodline. I come from a family whose lineage started from grains of muri. My Grandfather, the late Alamohan Dass, was a poor man with dreams. In the early twentieth century at the age of 15 he left his tiny village of Khiley for Calcutta, in hopes of securing a better future. 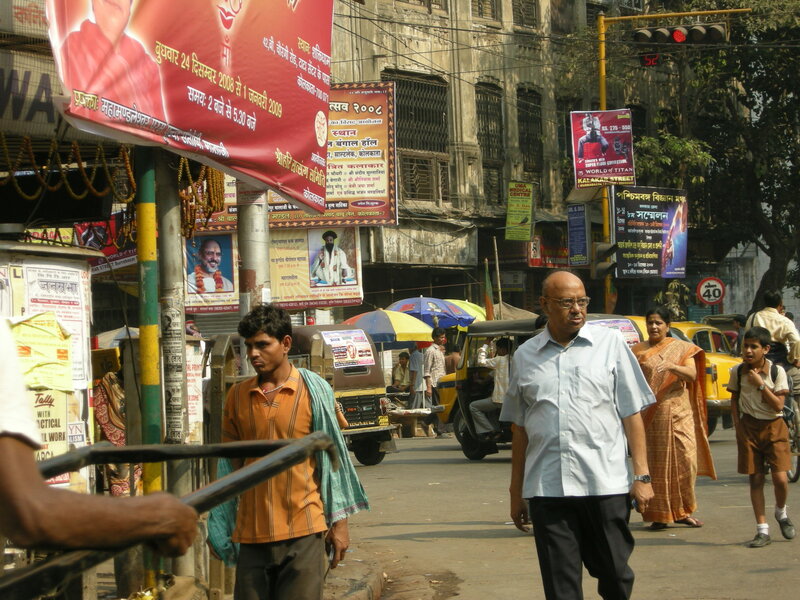 With very little education he ventured out to the big city to earn a livelihood. He wasn’t just one of the many who left their villages in hopes of a better future; he was a young man of considerable foresight and brilliance. A kind businessman on Galiff Street in North Calcutta gave my grandfather a small job as a door-to-door salesman of puffed rice. 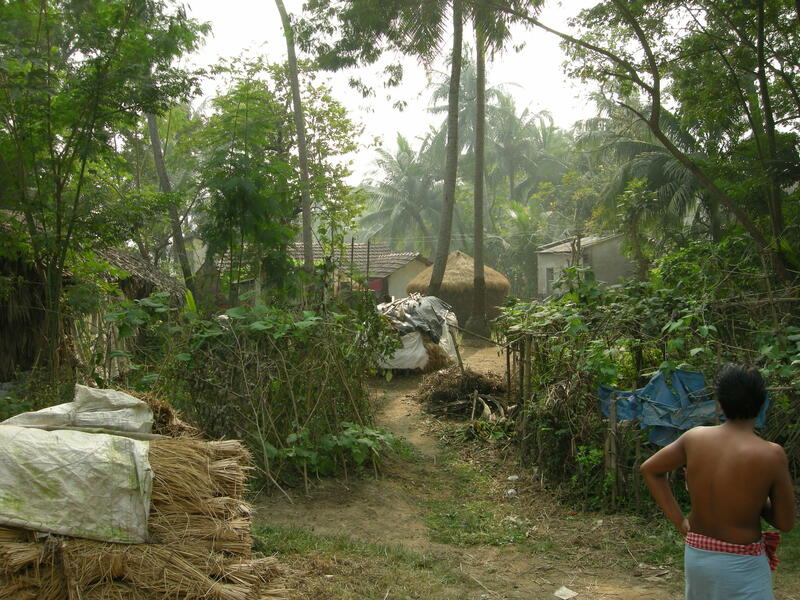 He slept on the cold brick pavement at night and worked as a puffed rice vendor during the day. Dreams fueled his ambition as he saved every paisa he earned. Soon he had saved enough for a small store of his own: a puffed rice corner store where he sold muri, saved his money, and planned his next venture. In the span of fifty years, my grandfather the muri vendor built an industrial empire and Dassnagar, an entire town bearing the family name. 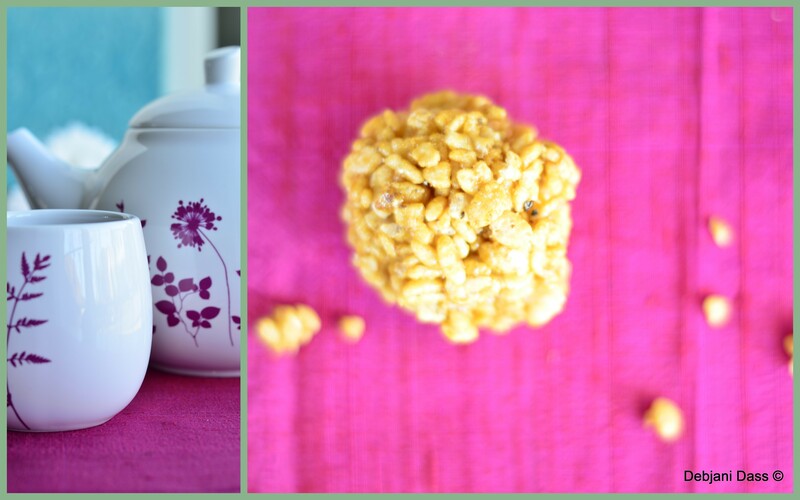 What’s in a puffed rice, you say? 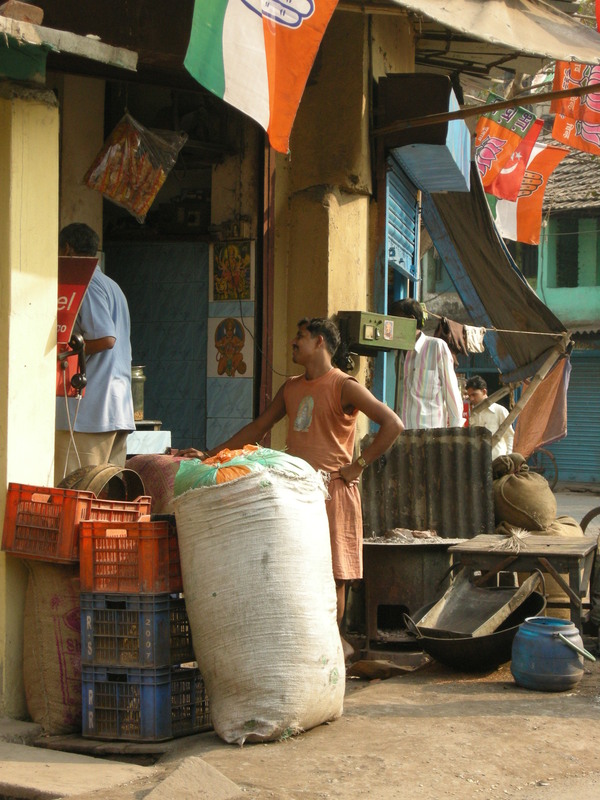 The story of a muri seller – my Grandfather – a dreamer and a realist. Muri is in my heart. Muri is an everyday food not just in our household but in millions of households in India. The large square “muri’r tin” (a recycled air-tight metal container used to keep the puffed rice fresh and crisp) is rarely empty in our household. Muri is often served for breakfast with “aloo chorchori” (a potato curry with nigella seeds); or as an evening snack tossed in mustard oil accompanied by roasted peanuts, small diced cucumbers, red onions, fresh coconut, ginger and hot green chilies (or served plain when heartburn threatens). “Jhal muri “, or spiced puffed rice with salad, served in a “kagocher thongha” (paper bag made of recycled newspaper), is a national favorite and a street experience often tried but seldom replicated at home. Perhaps a ‘jhal-muri’ vendor underneath those umbrellas? 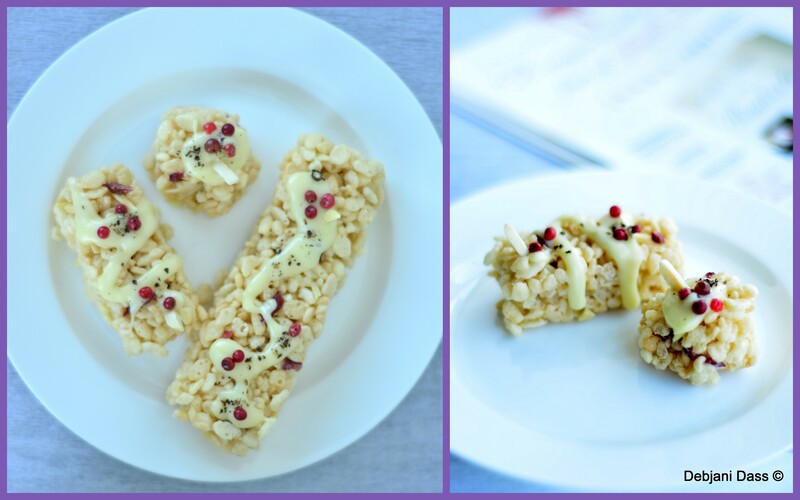 Here are two recipies for rice krispies: one adapted from the well-known rice krispie square recipe and altered by using pink peppercorns the other a traditional Bengali recipe my mother makes with black peppercorns. 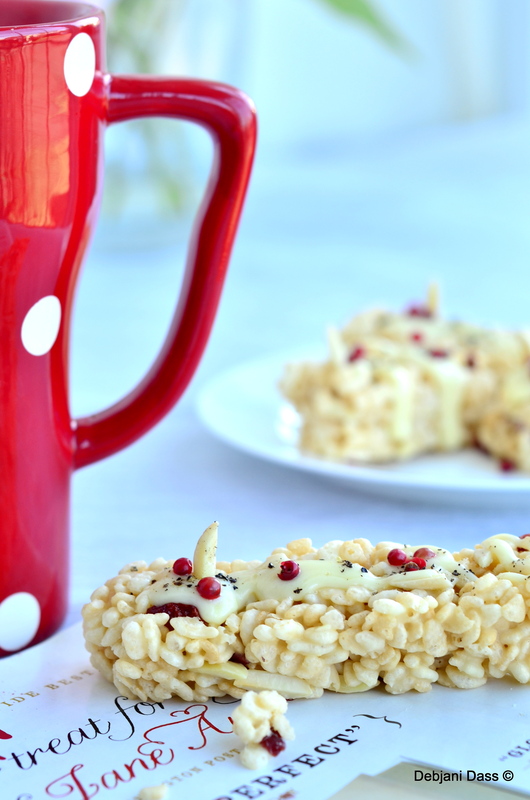 The traditional Rice Krispie bar gets a wake-up call with white chocolate chips, slivered dried sweet cranberries, toasted almonds and some of those beautiful pink peppercorn berries. Butter a 9 x 13-inch baking pan. Melt the butter over low heat on a large pan for easy mixing. Add the marshmallows. Stir until the mixture is melted and smooth. Add the vanilla. Add the white chocolate chips and stir. The white chocolate chips will melt in the hot marshmallow mixture. Add rice cereal, cranberries, almond slivers and red peppercorns. Stir until the cereal is uniformly combined with the marshmallow mixture. Work quickly. Remove the mixture to the buttered pan. Evenly distribute the mixture and press it down into the pan with buttered fingers, a piece of waxed paper, or a spatula. Let cool and cut into a shape of your choice. To garnish drizzle melted white chocolate. Add a few whole red peppercorns and sprinkle some coarsely ground black pepper corns. Store in an air-tight container and consume within two days. 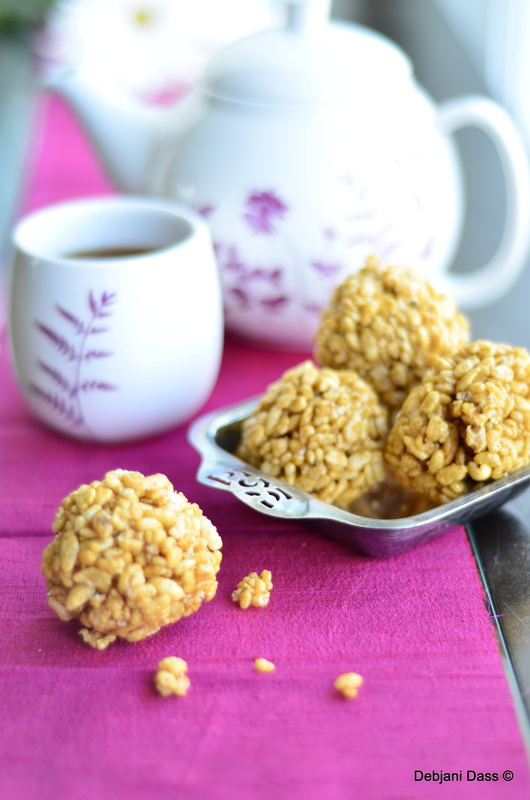 “Murir Moah”, my Ma’s recipe for a simple, caramel sweet, salty and spicy delightful little rice krispie ball made with ” gurr” (jaggery), salted peanuts and “kalo morich” (black peppercorns). Add the molasses and water in a pan, bring it to boil on medium low heat and cook stirring frequently. The syrup will become frothy about 10 minutes till the syrup coats the back of the spoon consistency. When syrup is dropped in water it it stays in shape, the syrup is ready. Take off heat and add the peppercorns and butter and stir well. Add the rice krispies and the peanuts. Mix well working quickly. Let mixture cool for a minute. Grease your palm with a little bit of butter, now take a palm full of mixture and by gently pressing the mixture together form balls. The mixture can be shaped any way but must be done quickly without letting the mixture cool down too much. Once the mixture is cooled it will be hard to form any shape. The left over bits are great served over vanilla ice cream or over a bowl of yogurt. Thank you so much for reading! I don’t know a single Bengali soul who doesn’t like Muri’r moa! Your recipes are gorgeous, too! These treats look very moreish! Love the recipe, the text and the photos! Lovely! Muri; great snacks I always buy when I came to India to study. Now back home to Africa but not available. Gratefully send a link from where I can learn how to prepare it at home, the traditional way, since I can’t lay hand on machines to help the process here. Sweet write up. Sweet as muri. Muri; great snacks I always buy when I was in India for study. Now back home to Africa but not available. Gratefully send a link from where I can learn how to prepare it at home, the traditional way, since I can’t lay hand on machines to help the process here. 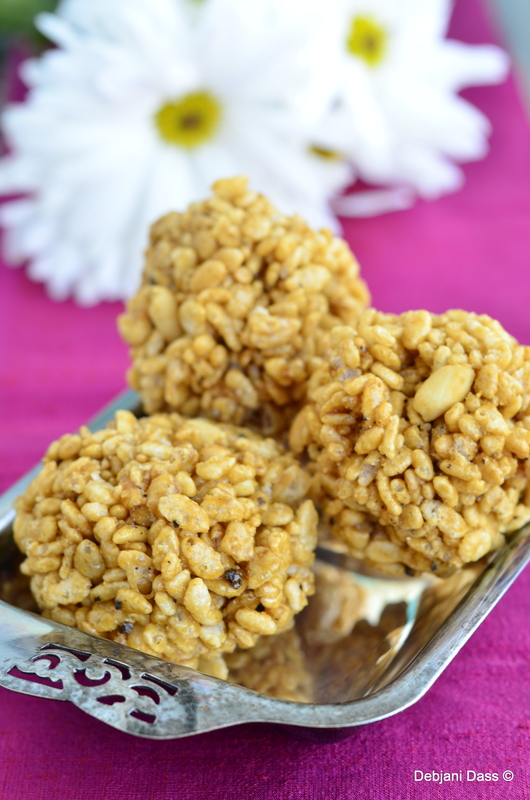 I am not sure there are any videos that can help with making puffed rice at home. I wish there was. It is a special process involving very traditional methods and products. I bring murk back from home when I visit and they puff away as soon as they land….so so good!